I grew up on the Prairies, and my parents both came from families that had been on the Prairies for generations. I believe that part of my heritage links me to an innate sense of country living. Not only existing in small towns where the community is smaller and more intimate, but also coming from an environment that was more harsh and unforgiving than bountiful. Not to mention that I grew up with relatives who had living memories of the Depression, wartime and rations. As a result, I am always conscious of waste, and thinking of ways to avoid it. Today my kitchen project was simple: making sweet potato chips for “the troops”, our two dogs. Both Simon and Ella enjoy treats just as we do, but junk food is no better for them than it is for us. A crunchy sweet potato chip is a nice way for them to have something without any processing except dehydration. (Seven hours at 130F works perfectly. ) There is no mess ; Simon sometimes leaves a few crumbs, but Ella is a master at clean-up, being a Labrador. The only catch is that the ends of the potatoes are too small to use for chips, due to the tapered shape. We do have a compost, but why not use the ends in another way? I had an epiphany one day while making the chips and thinking of what to put in our salad for dinner. 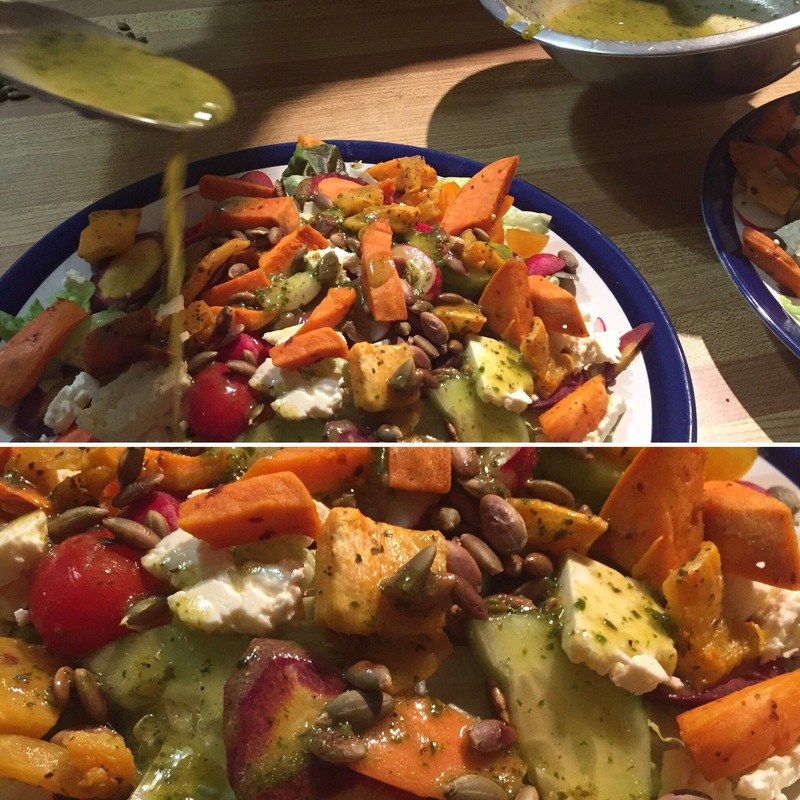 How about roasting pieces of sweet potato and adding them to the salad? It worked like a charm. I put the pieces on a baking sheet with some olive oil and herbs & spices (whatever strikes my fancy that day). I love my exotic spices. This time I used Aleppo pepper on some pieces, and Aniseed Myrtle on others. About 20 minutes in a moderate oven and presto! We can just as easily leave them in the fridge for another meal if need be. At least all that food isn’t wasted. I suppose you could say this is another way to look at the concept of “nose to tail” cooking, in the vegetable world. I’m proud that I have kept something out of the compost – yay me! Somehow the lack of guilt I feel makes the salad taste better.